Authors (in signing order): Ruiz, M.; Bangalore, S.; Lambert, P.; Màrquez, L.; Montiel-Ponsoda, E.
Abstract: With the increasingly global nature of our everyday interactions, the need for multilingual technologies to support efficient and efective information access and communication cannot be overemphasized. Computational modeling of language has been the focus of Natural Language Processing, a subdiscipline of Artificial Intelligence. One of the current challenges for this discipline is to design methodologies and algorithms that are cross-language in order to create multilingual technologies rapidly. The goal of this JAIR special issue on Cross-Language Algorithms and Applications (CLAA) is to present leading research in this area, with emphasis on developing unifying themes that could lead to the development of the science of multi- and cross-lingualism. In this introduction, we provide the reader with the motivation for this special issue and summarize the contributions of the papers that have been included. The selected papers cover a broad range of cross-lingual technologies including machine translation, domain and language adaptation for sentiment analysis, cross-language lexical resources, dependency parsing, information retrieval and knowledge representation. We anticipate that this special issue will serve as an invaluable resource for researchers interested in topics of cross-lingual natural language processing. With the increasingly global nature of our everyday interactions, the need for multilingual technologies to support efficient and effective information access and communication cannot be overemphasized. Computational modeling of language has been the focus of Natural Language Processing, a subdiscipline of Artificial Intelligence. One of the current challenges for this discipline is to design methodologies and algorithms that are cross-language in order to create multilingual technologies rapidly. The goal of this JAIR special issue on Cross-Language Algorithms and Applications (CLAA) is to present leading research in this area, with emphasis on developing unifying themes that could lead to the development of the science of multi- and cross-lingualism. In this introduction, we provide the reader with the motivation for this special issue and summarize the contributions of the papers that have been included. The selected papers cover a broad range of cross-lingual technologies including machine translation, domain and language adaptation for sentiment analysis, cross-language lexical resources, dependency parsing, information retrieval and knowledge representation. We anticipate that this special issue will serve as an invaluable resource for researchers interested in topics of cross-lingual natural language processing. 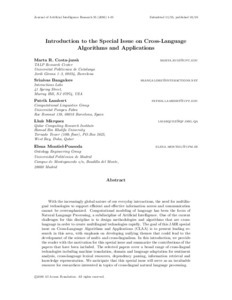 Citation: Ruiz, M., Bangalore, S., Lambert, P., Màrquez, L., Montiel-Ponsoda, E. Introduction to the special issue on cross-language algorithms and applications. "Journal of artificial intelligence research", 1 Desembre 2016, vol. 55, p. 1-15.